Jerry Lewis’ The Day The Clown Cried is like the Area 51 of cinema: Many have gone to great lengths to try to see it for themselves, but it’s held under such tight surveillance that few have managed to penetrate the security. The reason for Lewis’ reluctance to allow anyone to see it is understandable, however: The man wrote, directed, and starred in a Holocaust drama about a German clown who leads Jewish children into the gas chambers during World War II. It’s reportedly a glorious confluence of bad taste and bad choices, culminating in a perfect storm of terribleness. 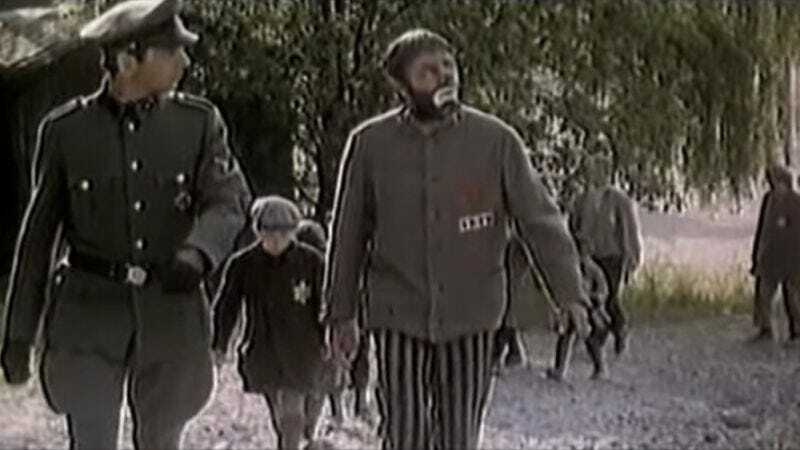 (Or, as Harry Shearer—one of the privileged few to have ever seen it—describes it, the film is “like going down to Tijuana and seeing a painting on black velvet of Auschwitz.”) Footage has surfaced over the years, but the complete film is still under lock and key. Lewis bequeathed it to the Library Of Congress, but only on condition it not be shown until June 2024. The best laid plans, and all that. ScreenCrush reports almost 30 minutes of the movie have surfaced online, put together in a rough edit of available footage. Some is pulled from a German documentary about the film, other sections are filled in with title cards, and it’s generally in rough shape. But despite all the missing material, it’s far and away the most comprehensive assemblage yet seen of the project, and the most faithful recreation since Patton Oswalt’s live stagings of the script. You can watch all of it above, or just skip to the last five minutes and stare in goggle-eyed amazement at a sad-faced clown leading children to their death.